Intel is committed to caring for our people and the planet by integrating design for the environment and safety principles into all aspects of our business; from the development of our products, through our supply chain and manufacturing. We believe that responsible environmental stewardship is good business and that our technology can play a key role in addressing the planet’s sustainability ...challenges. We will comply with all applicable regulatory and Intel Environmental Health & Safety (EHS) requirements wherever we operate. We will engage with stakeholders to develop responsible laws, regulations, and innovative programs that provide safeguards for the community, the workplace, and the environment while providing flexibility to meet the needs of our business. We are committed to provide a safe, injury-free workplace by integrating safety into our daily business decisions and processes. Management leads the effort behind this important Intel value, and all employees are responsible for both their safety and the safety of those around them. We actively promote a healthy lifestyle and encourage employees to proactively manage their personal health. Overall, we are committed to continually improving our EHS standards, culture, and performance, and will transparently report our performance goals and metrics. We will continue to maintain appropriate controls, including periodic review, to ensure that this policy is being followed. 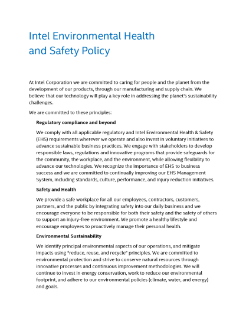 Read the full Intel Environmental, Health, and Safety Policy.